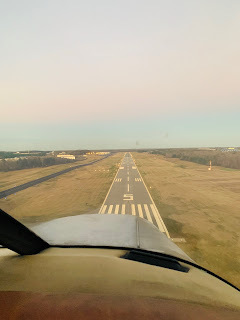 Today's flight was pretty routine, getting more hours in outside the pattern. Today we climbed up to 3500 feet to the base of the clouds and out to the practice area. It was a little too bumpy to work on manuevers but still a nice little flight. It was also the first flight with the wheel pants, new tires and new beacon. Any time spent in the air is good time.